A2Z Property Inspections is hiring home inspectors with or without experience we will train. Been to class and want to get going in your new career, I'll show you how give me a call. This page summarizes information provided at the Zinsco® & Zinsco-Sylvania® Panel/Circuit-Breaker Hazards Website - at the online encyclopediaInspectAPedia.com®. This page may be freely distributed in print or electronic form and may be copied to other websites. Do not alter the content of this page without first contacting usfor permission. InspectAPedia.com privacy and content use policies can be viewed at Accuracy & Privacy Policies. Photo at left of a burned-up Zinsco circuit breaker was provided by A.K. and was the neighbor of another Breaker that jammed and burned in the electrical panel. InspectAPedia.com is an independent publisher of building, environmental, and forensic inspection, diagnosis, and repair information for the public - we have no business nor financial connection with any manufacturer or service provider discussed at our website. Zinsco® and Zinsco-Sylvania® were a widely-distributed electrical panel brand throughout the United States. For years, anecdotes and field reports about Zinsco® equipment hazards and defects have been discussed at professional conferences and occasionally in the media. Field reports circuit breaker burn-ups and very extensive electrical panel damage have been reported attributed to this product. Independent testing of a significant volume of Zinsco® breakers and electrical panels has not been completed, leaving electricians and inspectors to rely on the body of field experience. There has been no product recall. What therefore remains arguable is the frequency with which a Zinsco equipment failure actually has caused serious house fires or losses. On at least some occasions an electrical component fails, melts, even catches fire without setting a building on fire, thanks to other construction safety features (such as properly-mounted steel electrical panel enclosures). So how do we estimate the Zinsco / Kearney risk level? With the exception of the more seriously failing FPE Stab-Lok electrical panels, we have not received any significant number of field failure reports concerning any otherelectrical panel brands that also use aluminum parts and that are or were priced in the same range as Zinsco. This means homes with Zinsco-brand circuit breakers and electrical panels are likely to be at significantly greater risk such as burn-ups, fires, and failure to trip in response to overcurrent. Limited test results reported by J. Aronsteinindicate that the central Zinsco electrical panel and circuit breaker failure problem appears to be burn ups at the clip-to-bus connections such as shown in our photo of a burned Zinsco electrical panel bus and breaker. The few circuit breakers tested by Dr. Aronstein were reported to trip within normal overcurrent limits. However a circuit breaker whose bus connection burns can lead to overheating damage to the circuit breaker itself, rendering it non-functional. Based on an independent review of field reports from licensed electricians, fire inspectors and home inspectors, there is little doubt that the equipment is a fire and injury hazard. Zinsco-type circuit breakers may fail to trip in response to an overcurrent condition. This is a fire and shock risk. 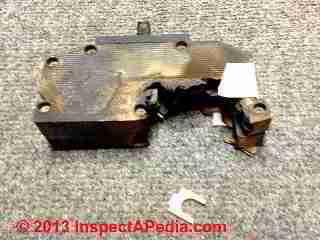 Zinsco-type circuit breakers may "blow out" the side casing of the device in an electrical "arc explosion"
Zinsco-type circuit breakers may fail to drop power even when they are switched off - that is, the breaker may appear to be switched to the "off" position but internally it may still be conducting power to the circuit. Notes: further testing & verification are needed on point 3. Other Sylvania® electrical products are not affected by and have nothing to do with the Zinsco-Sylvania warnings in this article. Zinsco® fire & injury hazard: In addition to the failure of these circuit breakers to protect a building and its occupants from dangerous overcurrents, it is visually obvious from photographs of Zinsco equipment failures that severe overheating occurs in the equipment, thus risking fire and fire related injuries. Zinsco® is a latent fire and shock hazard: the presence of the equipment in a home does not itself initiate a failure in all cases, but it might in some. Because on disassembly the electrician often finds evidence of severe Zinsco electrical panel breaker-to-bus connections, one apparent source of overheating and failures, the equipment failure may not be visible nor even suspected by the homeowner before there is a catastrophic event. Furthermore, when a dangerous overcurrent occurs, the Zinsco equipment is likely to fail to provide the safety protection that is expected of circuit breakers because the overheated, burned circuit breaker fails to trip. For this reason, an owner's failure to observe a problem "up to now" is absolutely no assurance that the Zinsco® or Zinsco-Sylvania® panel is safe. It may simply be that an overcurrent has not previously occurred and the circuit breakers have not been called-on to do their job. Zinsco® equipment violates the National Electrical Code Because of the proven high defect rate, the Zinsco breakers do not provide the circuit protection that is required by applicable codes and standards (NEC and UL). This constitutes an increased risk of fire and injury. NEC-240-2 "Equipment shall be protected against overcurrent ..." - a building with FPE a Stab-Lok® electrical panel does not meet the requirements of the NEC nor of any other electrical code. Zinsco® field inspection or testing not reliable: There is no practical way that a licensed electrician, inspector, or engineer can determine which breakers in a given electrical panel are seriously defective internally. The only way to do that is by means of functional and life test procedures that they are not trained to do nor equipped to perform. Do not attempt field testing of Zinsco® equipment. Doing so risks serious fire or injury, and testing, even simply switching breakers on and off increases the risk of a future failure to trip. Replace Zinsco® equipment: Given these facts, Zinsco® electrical panels and circuit breakers should be considered an un-due fire and injury risk and we recommend that the equipment be replaced completely. Do not purchase and install replacement Zinsco-type circuit breakers. Replace the electrical panel entirely. Bottom line on Kearney, Zinsco-Sylvania & Zinsco Breakers & Panels This means the equipment fails to protect occupants from electrical shock or fire at levels anywhere close to other brands and models of similar circuit breakers & panels..
InspectAPedia.com is a free online encyclopedia of building & environmental inspection, testing, diagnosis, repair, & problem prevention advice, including all residential & light commercial building components, materials, & mechanical systems. Illustrated, detailed, in-depth research on finding, diagnosing, testing, correcting, & preventing building defects, energy conservation, & indoor environmental hazards. Research on building failures & education course material on building failures & building environmental inspection testing, diagnosis, & repair. © Copyright 2015 InspectApedia.com. 03/10/2013 - 03/10/2013- http://InspectAPedia.com/electric/Zinsco_Summary.htm - © 2014 - 1988 Copyright InspectAPedia.com All Rights Reserved - InspectAPedia® is a Registered U.S. Trademark - This page may be copied to other websites as long as it is not modified. This page may be freely printed and distributed as long as it is done so without charge and as long as it is not used to endorse or sell a particular product or service. Author/Editor: Daniel Friedman.